You have a fabulous present waiting for you at our house. I'll give you one clue: It's not dilapidated lemon cake. Although I am a bit disappointed about the cake thing. But the real fun in that cake was watching you make it. For sure. 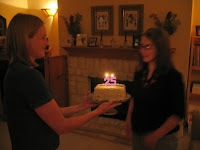 Wait...did you photoshop that cake to say 25? That's awesome. of course... or maybe you actually did attend a birthday party in your honor, but you were so wasted that you don't remember a thing. Twenty five. I like this number a lot. So nice and round and easy to remember. I'm afraid this means you're going to be stuck here for as long as you were at "four." I love you! Feel better!!!!! !